When looking for the top rated concealed carry holsters for your Concealed Carry Handgun, there’s no shortage of great options available. One company that has made a name for themselves providing a wide range of concealed gun holsters that are suited for an equally wide range of firearms and uses is Urban Carry. In this article, we will look at the 10 Top Rated Concealed Carry Holsters. This will help you determine the gun holster that is the best suited to your needs. I am Dave Smith, working as a marketing strategist at Urban Carry. We house the best collection of leather gun holsters that you can easily wear against your body along with off the body holsters such as handbag holsters and desk or car holsters. We also offer a wide range of other gun accessories such as range bags and gun maintenance mats. One of the most innovative IWB tuckable concealed carry holsters on the market today is the G2 holster by Urban Carry. This is designed to allow you to carry your firearm below your waistband. At the same time, you’re able to retrieve it as quickly as you could from an outside the waistband holster. Since ease of draw is one of the main drawbacks of inside the waistband holsters, the G2 holster is able to eliminate this. Concealing a weapon with the G2 holster is incredibly easy since it is designed to completely obscure the weapon underneath your waistband. This means that you won't have to dress around your gun to maintain adequate concealment. No matter what you’re wearing, the only part of the holster that remains visible is a small strip of leather that is not identifiable as a concealed holster. Another innovative gun holster manufactured by Urban Carry is the REVO Rig OWB holster. This rig is used in tandem with the REVO shell (the portion of the holster that the firearm is stored in). The benefits of the REVO Rig OWB holster are two-fold. For one, this rig allows you to rotate the angle that your firearm rests at to the position that is most comfortable for you. With most holsters, the firearm rests at a straight, 90 degree angle, and there isn't much room for customization. The second benefit of the REVO Rig OWB holster is that it strongly secures your firearm in place. When an assailant tries to wrestle your firearm away from you they attempt to tear off the entire holster from your belt rather than drawing the firearm. The REVO Rig OWB holster is designed to make tearing the holster off of your belt next to impossible. As the name suggests, the REVO Rig OWB holster is an outside the waistband holster. This allows for very fast and smooth draws along with all-day comfort. The REVO Rig IWB holster offers all of the same advantages as the REVO Rig OWB holster. However it enables you to conceal your weapon beneath your waistband. If maximum concealment is one of your priorities, then this rig is an excellent option to consider. Like the REVO Rig OWB holster, the REVO Rig IWB holster allows you to adjust the angle that your firearm rests at. Enabling you to customize the draw of your weapon to what suits you best. You’re able to use the REVO IWB holster in a variety of positions and simply adjust the Shell to customize your draw. If you are looking for one of the best IWB tuckable concealed carry holsters that offers maximum concealment, comfortable leather, microfiber construction, and the ability to customize the angle that your weapon rests at for an optimum draw. Then the REVO Rig IWB holster is great choice to look into. The REVO Rig IWB Plus holster is almost identical to the standard REVO Rig IWB save for one key distinction. 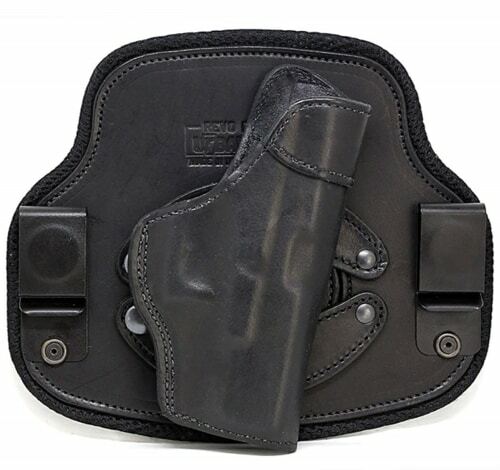 The REVO Rig IWB Plus holster comes with of extra padding and material for increased comfort. Comfort is a common issue with IWB holsters as your waistband presses the weapon tight against your hip. After a full day of carrying a weapon, this can easily become an annoyance. With the REVO Rig IWB Plus holster you get a lot more padding to ensure that no hard edges dig into your hip. Alllowing you to fully conceal your firearm and remain comfortable at the same time. Like other REVO Rigs offered by Urban Carry, the REVO Rig IWB Plus holster is modular. So you can use multiple firearms on one Rig, or multiple Rigs with the same Shell and you have the ability to customize the angle that your firearm rests at. For those searching for one of the best shoulder holsters, the REVO Rig shoulder holster is definately a high quality option available. This rig comes with two attachment points, enabling you to carry multiple weapons or extra magazines. The straps on the REVO Rig shoulder holster are designed for maximum comfort and are infinitely adjustable. No more one inch increments! With the REVO Shoulder Rig, you can carry a firearm and dual/single magazine pouch, or even two firearms. And because of the unique design, this shoulder rig spreads weight evenly making it extremely comfortable. Appendix holsters are becoming increasingly popular with concealed carry permit holders. This is because they offer an excellent degree of concealment as well as easy access to the weapon. With the REVO Rig Appendix Holster, you get a rugged holster that enables you to take full advantage of this carrying technique. Simply adjust the angle that your weapon rests at for a more natural draw. The REVO Appendix Rig allows for multiple ride heights, infinite cant angles, and the single belt clip design allows for comfortable movement. These advantages make the REVO Rig appendix holster a great option for anyone who values both maximum concealment and ease of access to the weapon. Concealed carriers do not always have their weapon on their person. When you are at home you will still need a way to properly secure your firearm. Likewise, if you are traveling in a car you may wish to secure your weapon in the vehicle rather than having it on your body. For these applications, you need a quality off-body gun holster such as the Stoker Off-Body Holster. Adhesive-backed Velcro enables the Stoker off-body holster to secure to any surface. This makes it easy for you to secure your weapon off of your body when you are at home, at work, or on the road. Having your weapon unsecured in a desk drawer or a glove compartment is a safety concern. You risk accidentally discharging the firearm when searching for other items that are also stored in its location. In addition to this, it's difficult to know the exact orientation and position of a weapon that is not secured in a holster. This will cost you valuable seconds in a situation where you need to quickly access your weapon. By securing your weapon in the Stoker off-body holster when you are not carrying it on your person, though, these issues are no longer a concern. Ankle holsters may not be the most common method of concealing a firearm, but they do fill a very important niche. If you are concerned about maximum concealment then an ankle holster is a great option to consider. Ankle holsters are popular with people who spend a lot of time in close contact with others. Even in close proximity most people will not spend much time looking down at your ankles. Ankle holsters also eliminate the requirement for you to dress around your weapon. So long as you are wearing pants that are long enough to cover the holster the weapon will remain concealed no matter what the rest of your attire consists of. This makes the REVO Ankle Rig popular with business and medical professionals. Even in a suit or scrubs, the ankle holster remains concealed and comfortable. The REVO Rig ankle holster offers all of the advantages of a quality ankle holster in addition to advantages that are specific to the REVO Rig. Such as the ability to customize the angle that your weapon rests at and a lock-tight construction that makes it near impossible for someone to tear your holster off of your body. 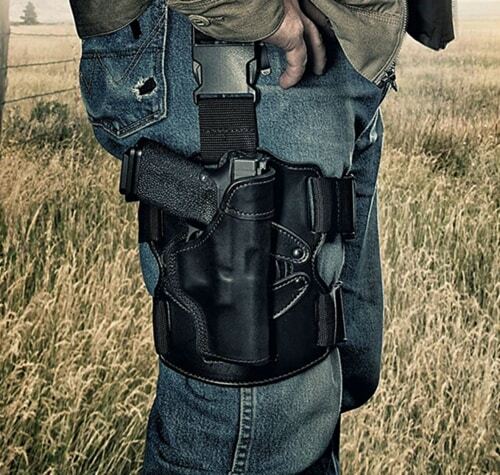 Drop-leg holsters also known as concealed carry thigh holsters are an open carry holster option. So it’s important to know state laws regarding open carry of a firearm. However, the tactical advantages of drop-leg holsters are considerable. Drop-leg holsters position your firearm at the optimum position for a quick, smooth draw as the handle of the weapon will be level with where your hand naturally rests when your arms are at your sides. This is great for those in tactical environments such as law enforcement, or those who use a handgun for hunting. Drop-leg holsters also help eliminate the risk that your weapon snags on your clothing as you draw it. This is because of the added distance between your firearm and the bottom of your shirt or jacket. It’s also an extremely comfortable way to carry, making it great for outdoor activities. When open-carrying a firearm, though, making the weapon difficult for an assailant to wrestle away becomes a high priority as everyone in the area will know that you have a weapon on you and may plan their attack accordingly. With REVO Rig Drop-Leg Holster, it becomes much more difficult for someone to steal your weapon as they must actually draw the firearm rather than just tearing the weapon off of your body, holster and all. The REVO Rig drop-leg holster also allows you to customize the angle that your firearm rests at, taking a holster that already makes drawing your weapon incredibly easy and making it even more easily accessible. Carrying a weapon in your purse or satchel as opposed to on your body is a popular option for many concealed carry permit holders. However, it's not enough to just drop your weapon down into your purse unsecured. Not only does this present a safety concern, it also makes it more difficult to quickly draw your weapon since you will have no way of knowing where exactly in the purse it is located. Or more importantly how it is orientated. Enter the Satchel Concealed Purse by Urban Carry, which is a full-sized, leather purse designed specifically for concealing a firearm. The Satchel Concealed Purse comes complete with a holster that is sewn into the construction of the purse, making it easy for you to secure your weapon in your purse without any hassle. 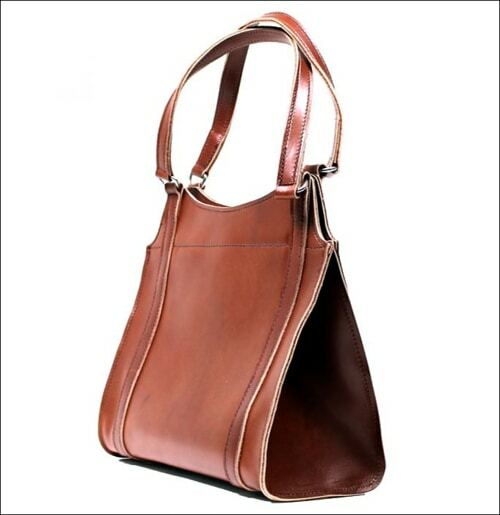 The best part about the Satchel Concealed Purse is that it is a high-quality, great-looking purse in addition to being a high-quality concealed carry holster for women. The purse also comes with a security cable that is sewn into the shoulder strap of the purse to prevent slash and grab theft. One of the main benefits of Urban Carry holsters is their level of innovation. Both the REVO design and the G2 design are unlike anything else on the market today. More than just another traditional leather holster, these holsters are designed with top-notch attention to detail and unique features that offer advantages you simply won't find with standard holsters. In addition to innovative design, Urban Carry holsters are also built to last. 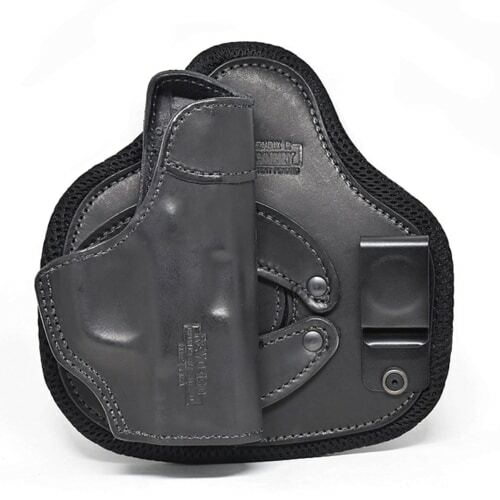 These holsters are made using saddle grade leather and stainless steel as the two primary materials. Which means they are built in such a way as to remain functional for a lifetime. Lastly, Urban Carry Holsters offers plenty of options as to how you wish to carry your firearm. Whether you want to carry your weapon on your ankle, inside your waistband, off your body in a purse or glove compartment. No matter where, there is an Urban Carry holster suited for that application. When deciding which Urban Carry holster is right for you, start by identifying your priorities. For example, if maximum concealment is your number one priority then you may want to consider a holster such as the Urban Carry G2 or the REVO Ankle holster. Likewise, if being able to easily access your weapon is more of a priority than concealment than you may want to choose the REVO Concealed Carry Thigh Holster or the REVO OWB holster. Once you have identified what it is that you are looking for in a holster, you'll next want to match the holster you are considering to your weapon. Keep in mind that holsters come in a wide range of sizes in order to accommodate many different firearms. Therefore you will want to be sure and choose a holster that is designed to secure the type of firearm that you own. Also, realize that accessories such as tactical lights or red dot sights will change the size of your firearm. So this is something that should be taken into consideration when choosing a holster size. Lastly, realize that one holster will rarely be able to fit all of your needs. Most people who carry a concealed weapon choose to own multiple holsters of different types in order to give themselves more flexibility in regards to how and where they carry their weapon on any given day. With all of these things considered, you should be able to choose the Urban Carry holster that is best-suited for you. Urban Carry certainly has the Top Rated Concealed Carry Holsters on the market today and they cater to a wide range of concealment needs for both him and her. Of the holsters they have available, the one we most recommend is the Urban Carry G2. The level of concealment and ease of access that this holster offers thanks to its truly innovative design is simply unparalleled by other holsters on the market today. Ever thought about building your own firearm? If so, check out this article on the Polymer 80 Pistol to get started.